Daniel Wohl (left) and Daniel Schwarz at Massachusetts Museum of Contemporary Art. Fair warning: After listening to Daniel Wohl’s music, you may begin to question your senses. “I’ll start with a percussionist or a string player recording a sound,” explains the 35-year-old electroacoustic composer, “and then I’ll process it in different ways, and stack up the recorded versions against the live, acoustic performance to create a sort of augmented reality. So when you listen to the album, it’s kind of a mystery as to what’s being played live and what’s electronic. 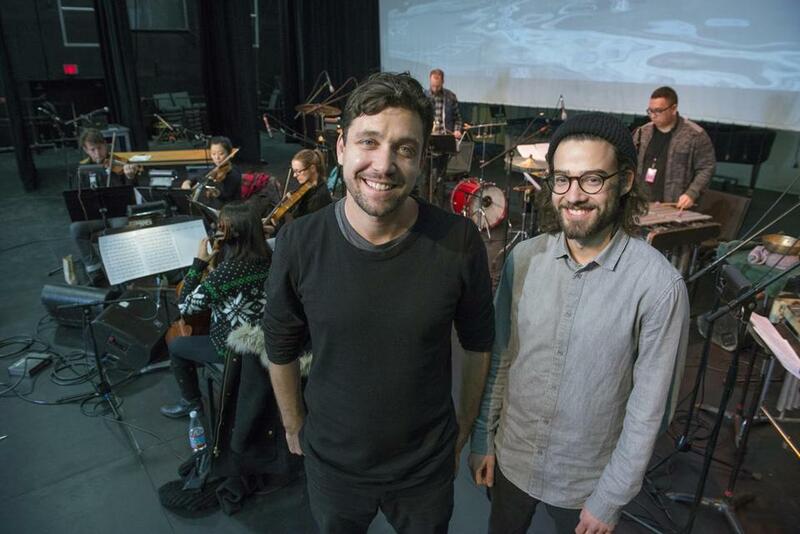 On Saturday at Mass MoCA, new music lovers will have an opportunity to do just that, with a multimedia performance of “Holographic,” Wohl’s latest collection of gorgeously perplexing soundscapes. The work-in-progress performance features imagery by audiovisual artist Daniel Schwarz, culminating a weeklong residency for both artists in anticipation of the album’s performance premiere in New York on Jan. 21, and the Jan. 29 CD release on New Amsterdam Records. “Holographic,” which was co-commissioned by Mass MoCA, is only the second full-length album for the Paris-born, LA-based Wohl. His debut venture, “Corps Exquis,” garnered praise from The New York Times and NPR, among others, and placed Wohl squarely on the new-music map for his surreal blurring of boundaries between electronic and acoustic instruments, weaving complex, richly textured tapestries of sound that live in the interstices of sonic perception. Even watching Wohl in rehearsal at the museum, moving regularly between the instrumentalists onstage and the electronics on his computer, it can be difficult to distinguish between live and pre-recorded sounds. “A lot of it comes from what I listen to,” says the classically trained Wohl, who cites everyone from modern composers Steve Reich, Gyorgy Ligeti, and Krzysztof Penderecki to electronic artists Tim Hecker, Oneohtrix Point Never, and Lucky Dragons — with whom Wohl collaborated on “Shapes,” the closing track on “Holographic” — as influences on his work. Along with processing real instruments, Wohl incorporates field recordings, samples of other music, and snippets of vocals into his multilayered compositions, which shift effortlessly from rhythmically propulsive to gratingly discordant, and to darkly romantic and droney. He also likes to experiment with translating musical ideas between forms: imitating a vocal sample with another instrument, or even transcribing electronic sounds for live instruments. For “Holographic,” Wohl and Schwarz spent months working closely together to create a “metalanguage” that synchronizes their machines. Schwarz built custom software that reacts in real time both to live feeds from the musicians and electronic inputs from Wohl, and generates visuals that range from geometric shapes and color shifts to live news feeds and publicly available satellite imagery. But while he’s excited about creating engaging multimedia performances of his complex compositions, for Wohl it’s ultimately about how people feel when they close their eyes and simply listen to his music. Stacey Kors can be reached at sgkors@gmail.com..